The Best Travel Backpack for 2019 - Our Readers Voted! What do people consider when buying a backpack for travelling? The Best Travel Backpack Recommendations – Order of Popularity! Sometimes You Just Want Extra Space! The Case for Packing Light! 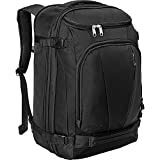 Most popular travel backpack brand? Everyone is different – Which bag is right for your travels? In a recent Readers Poll, we asked you: What’s the best luggage to take with you to Southeast Asia? AND, which size and brand of travel backpack is your favourite? We received over 200 comments on our Facebook wall and in various other Southeast Asia Backpacking groups on the social network. So what did we discover about suitcases, travel bags and backpacks for travelling? Well… Sit back, relax, and read some words of wisdom from fellow travellers in the region! Unsurprisingly given our audience, the traditional backpack was voted the best type of luggage to travel with in Southeast Asia. (Perhaps the results would have been different if we were called southeastasiasuitcase.com!). Don’t worry, we’ll get on to which backpack to go for very soon. First, let’s look at why the backpack is best. 1. Getting up and down stairs – Suitcases or rolling backpacks are great on flat surfaces, but when it comes to getting up and down stairs, you’ll regret not being able to throw your luggage on your back. Many metro stations in Asia (including the sky train in Bangkok) don’t actually have lifts or escalators so carrying a suitcase can be a nightmare! 2. Busy, uneven streets – It can be difficult to manoeuvre a backpack with wheels down a busy street in Southeast Asia, with dusty roads, potholes and uneven pavements! 3. Monsoon season! During the monsoon months in Southeast Asia, the streets can fill with 20cm water in a matter of minutes. Now how are you going to get your wheeled suitcase to the bus station? Khao San Road, Bangkok: Hard to walk, let alone wheel a backpack! 4. Motorbike rides – Whether you’re hopping on the back of a motorbike taxi to get to an off the beaten track destination, or taking a longer motorbike adventure alone or with your travel buddies – backpacks give you the flexibility to just go! 5. Hands free – With everything on your back, you’ve got your hands free to eat, drink, wave, get your money out, whatever you want to do! You’re more in control. 6. Arriving on tropical islands – Your longtail boat has just pulled up on the shores of paradise! Now try wheeling your roller backpack across that sandy beach to your beach hut! Getting to the longtail boat: Carrying your luggage is the only way to go here in Railay, South Thailand! 1. Accessing your stuff easily: You loved the backpacks that open like suitcases. Most people’s complaint (including mine) about a traditional backpack, is that it’s a pain in the arse when you’re trying to access all your stuff. It’s Murphy’s Law that the pair of shorts you want will be wedged right at the bottom of your bag and you’ll have to take everything out to get at it! So, you’ll want a backpack that doesn’t only open from the top but opens from the side like a suitcase as well. 2. What size backpack should you take? See the discussion on size preferences below. Some of you recommended taking as little as possible in a small bag. Some of you suggest taking a bigger bag but packing less stuff, so you have the extra space if you need it. Some of you swear by the nifty invention of packing cubes to maximise space and make you feel more organised on the road! 3. Price of your backpack. You reckoned it was best to invest! Should you buy yourself a cheap one or should you invest in a good brand like Karrimor, Osprey, Patagonia or Tortuga? From the recommendations, it’s clear that this is one travel necessity that people really do spend money on. Cheaper bags break and can also do harm to your back, plus more expensive bags can last a lifetime. 4. Suspension. Take that weight off your shoulders. If you’re planning on taking a certain amount of stuff with you, and your backpack ends up being quite heavy, the suspension becomes something that you need to think about. You’ll want to invest in a bag that distributes the weight evenly across your hips and back without putting all the weight on your shoulders. 5. Warranty. Some brands offer a lifetime warranty! Some backpacks offer a lifetime warranty, this means that if your back breaks or doesn’t function anymore in the way that it should, you can send it back to the manufacturer to get repaired. When you’re spending the money on a good quality product that you want to last, not just this adventure but the next (and the next! ), this is something that’s definitely worth checking out before you buy. 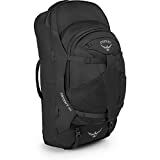 By far the most highly recommended backpack by those travelling in Southeast Asia for a month to six months was the Osprey Farpoint. Many of you said that this was THE BEST BACKPACK for travelling Southeast Asia. Why? Well, first of all, it opens sideways so that you don’t need to dig through to get the stuff you want. It has lots of different sized compartments so that you can organise all of your stuff. And, it’s small enough so that you can take it as hand luggage on most flights. Although it’s not cheap, the price is very reasonable for a backpack of this quality AND it has a lifetime guarantee! For those of you who need a little more space, Osprey also have a 46-litre option which was highly recommended by our readers. Recommended by a few of you. Again, this bag opens flat like a suitcase so you’ll never have to dig to find your stuff. It’s also the perfect size for carry-on luggage. A woman’s specific backpack with a little extra space, that serves as a normal rucksack for travel, or a more specialised backpack for trekking and climbing, with sleeping bag compartment, trekking pole attachment and loads of handy pockets and attachments. 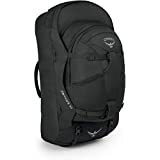 (Osprey have a whole range of travel backpacks for women). 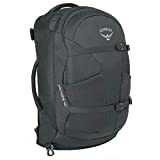 Best Carry-On Backpack for Flying? Also mentioned was the Cabin Max Metz Backpack Flight Approved Carry on Bag as the perfect bag for flying – at 44-litres. There’s a strong case for investing in a larger backpack – just in case! Even if you more space it doesn’t mean that you have to fill it to the max does it? You can still pack a 65-70 litre backpack with 10kg worth of stuff so that you’re not busting your back, and it’s still lightweight for flying. (Check airline rules as some will go on size rather than the weight of baggage). The Osprey wins again – with a few of you saying that this is the best bag that you’ve ever had! The backpack comes with a detachable daypack, so if you’re flying you can check the bigger part in and take the smaller bag with you on the plane. As it’s a larger back, it comes with a light frame suspension that transfers the load from your shoulders to your hips and a mesh back panel for ventilation and prevention of sweaty Southeast Asian back syndrome. Many people said that even when you pack it full and it feels pretty heavy, it’s still very comfortable and easy to carry on your back. And, when you’re not lugging it around, you can stow the suspension away making it sleeker to transport. With loads of compartments (side-opening for easy access) incredibly durable zippers, good quality material, suspension and detachable backpack – is this the ULTIMATE BACKPACK? The German brand Nomad was praised for their 70-litre Karoo and Batura Backpacks. *Available only in UK and European Amazon stores. Many of you also recommended the ACT and Aircontact models of the brand Deuter, which you reported as comfortable and really easy to carry, even when you cram them chock-full. They have loads of compartments and if you’re using them for camping/trekking, they have sleeping bag space/trekking pole attachment and very durable zips/material. The Berghaus Trailhead backpacks were mentioned as excellent backpacking/trekking rucksacks. They also have different models for men and women. The Osprey Farpoint 55 was also celebrated for all the same reasons as the 40 model – but with extra space! It has great reviews. Small backpacks for travelling light are some people’s preference. How much stuff do you really need? Is it possible to just travel with a small backpack through Southeast Asia for up to 12 months – or more? Many of you believed that taking a lightweight backpack that you can fit under your seat on the plane is the BEST and ONLY way to travel! Such free and easy travellers suggested that with some careful packing and rolling of your clothes, you could easily fit everything you need in a 30-35-litre backpack packed to the maximum 7-10kg. Why would you want to do that you may ask? Well, it’s better for your back carrying a lightweight backpack, that’s true. Plus, It’s easy to do laundry in Southeast Asia (a few kgs costs around 20 THB if you do it yourself in one of the machines in Thailand), so why not TAKE LESS and EXPERIENCE MORE? At this size, it was the Northface brand that was mentioned the most. It’s easy to carry on any airline and if packed carefully you have everything you need. Check out the whole 35-litre range here. This model was particularly recommended. Here are some reader’s comments on why you should pack light! Osprey definitely came out on top as everyone’s favourite backpack brand! As well as creating well designed, durable and flexible backpacks, it was their customer service which stood out to people and their amazing LIFETIME WARRANTY. Three backpackers with their matching Osprey Backpacks head to the Full Moon Party in Koh Phangan! Check out more of the Osprey collection here. We were amazed by the amount of feedback we received to this simple question. It seems that once you find a bag that you love, you’re loyal to that bag (and brand) for life! There were also quite a few people who preferred to travel with a duffel bag than a backpack. Some of you who still preferred a backpack with wheels (I’m one of these at the moment!) and some of you who just can’t say goodbye to that suitcase! Here at South East Asia Backpacker Magazine, we make no judgement – just go with whatever is right for you! And if you’ve bagged that bag – why not check out our ultimate packing list for Southeast Asia. If you have any more suggestions about the perfect travel backpack or any feedback about the research above, please let us know in the comments below!